The House for Mice are an part of the Music for Animals Project. The aim is to ask the "Human" audience some questions and hold in a ironic and philosophical matter a kind of mirror in the exhibition room. 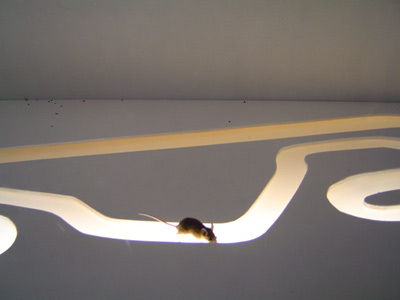 At the first presentation are 2 african desert mices inside the house. 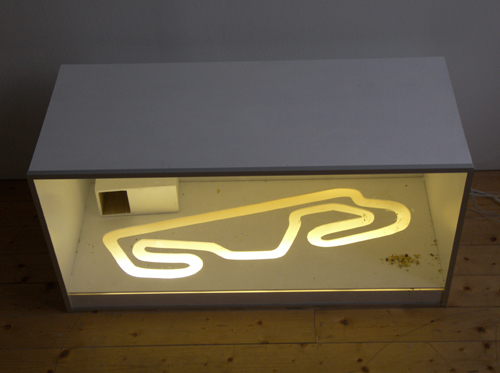 On the ground of the House are a ground-lighted 1 to 250 modell of the formular 1 racing track of Barcelona. (which are the fastest racing track). Ironically the mice are night active mice, they would´nt use the racing track in the "normal way" With this work I want to put the question on the table "what are the role of animals in our current society and open up some questions about architectur and animals and how to treath animals in our society." 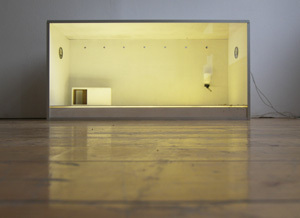 The soundtrack is an exclusiv release for that animals (mice) and only to be played in that Object.